The Labrador Retriever was recognized by the American Kennel Club in 1917 and thereafter rose slowly but steadily in popularity due to its incredible versatility, obedience, and rugged good looks. It is now considered the world’s most popular breed. Famous Labrador Retrievers include the title character from the film ‘Old Yeller’, Marley, from the bestselling memoir ‘Marley and Me’, and Tawny, a yellow Lab who gave birth to 18 puppies with her first litter in 1999 and was named the ‘Iams Mother of the Year’. The Labrador Retriever (also known as the ‘Labrador’ or ’Lab’) descends from the Newfoundland Dog and the St. John’s Water Dog in Newfoundland, Canada. It was bred to hunt in water and pull boats, which is evident to this day in its natural love for water. Contrary to popular opinion, the Labrador Retriever’s name likely derives from the Portuguese ‘lavradores’ or Spanish ‘labradores’, both of which mean ‘farm worker’, rather than the ‘Labrador’ region of Canada. We choose to give the Labrador an overall pet score of 99 because based on all the criteria for a family pet, we feel the Labrador is the top choice. Obviously every family is looking to fulfill different needs so we realize the Labrador might not be the right choice for everyone. He does need some open space to play in, and will need someone to take him on walks. Labradors are social dogs and are happiest when they are able to interact with their family on a regular basis. The Labrador Retriever has a shoulder height of 21-25 in and weighs 55-80 lbs. It has emotional brown or hazel eyes, a large nose, moderate stop (point at which the muzzle meets the forehead) and straight, thick tail similar in appearance to an Otter’s. The ears hang moderately close to the head, set rather far back, and somewhat low on the skull; slightly above eye level. Although not classified separately, the English and American lines have separate lineage. English Labradors tend to be heavier and blockier than the American Labradors which are usually tall and lanky. Because the English Lab’s size and features are considered the standard for the breed, the stocky, blocky Labs are generally considered the more desired look as opposed to the lankier American Labs. This doesn’t mean an American Lab isn’t purebred – it simply means the heavier bone frame, squarer head and stockier frame of an English Lab is considered “better looking” by the standards of the breed. 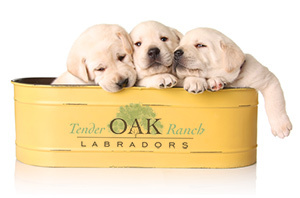 At Tender Oak Ranch, we breed toward the breed “standard,” meaning we strive for the English Lab features. However, we also believe the “correct” puppy, is every puppy that we match with its “perfect” family. The Labrador Retriever is unusually adaptable, obedient, and kind-hearted. No wonder it’s so popular! Labs are sociable, affectionate, and loyal. They have a very keen sense of smell. Most Labrador Retrievers are athletic; puppies are particularly active. The Labrador has a mellow personality and gets along well with children, other dogs, and any household pets. Some Labs may chew, but they can be trained not to. Labs do not make great watchdogs because they are friendly with strangers and are not territorial. According to the American Kennel Club breed standard, Labs should possess a “stable temperament, and be an “outgoing and devoted companion.” We have ranked their maintenance level at 85% because they do need plenty of exercise. They enjoy long walks and are especially fond of field sports, fetch, and water games. The Lab is intelligent and learns very quickly. They are ranked as the 7th most intelligent dog breed according to Canine Journal. They love to please their handler. Leash training is recommended when young. The Labrador Retriever is capable of learning a wide variety of dog sports including Frisbee and Flyball but they excel at nearly all tasks set before them. They are quick-witted problem solvers. Along with their high intelligence, Labs possess a superb handler focus and the grit to keep working even when it’s tough. This makes them perfectly suited to be trained as companion dogs for the blind, sick or elderly.